Last week I told y'all I had some very exciting news, and if you follow me on Instagram you may have seen something new at the end of my posts. It looks a little something like this, @liketoknow.it www.liketk.it/1XTr9 #liketkit, and it allows you to shop each one of my posts through an email that gets delivered directly to your inbox! I've been using LIKEtoKNOW.it personally for a while now, and if you love to shop like I do, it makes the process so much easier. Before I started using LIKEtoKNOW.it, someone would post an outfit or styled photo and I would fall head over heels in love with something from the post. Then I would spend hours upon hours searching for that exact item. Sometimes I would be able to, and other times I would fail miserably and either have to email the person who posted or comment and hope for a response. Now, all I have to do is like the photo and my shopping habit is fueled instantaneously. Definitely a win in my book! So, how do you sign up for this magical program you ask? Follow these three easy steps below! STEP 1: Register for LIKEtoKNOW.it by submitting your email and choosing a password. STEP 2: 'Like' Instagram photos that have @liketoknow.it www.liketk.it/1XTr9 #liketkit at the end of the caption. Note that the link will be a little different each time because it is unique to each photos. STEP 3: You'll receive an email with all the product links that looks similar to the one you see below. All you have to do is click on the products underneath the original Instagram image and it will take you directly to the product site! I know our everyday lives are inundated with emails, calls, and texts, so the last thing you want is one more thing coming to your inbox. I totally get it and so do the people who created the program, which is why you can choose exactly how many emails you will get from them! I personally have my email preferences set to get the emails ASAP #instantgratification, but you can choose to have them compounded and sent once a day or even once a week! If you're more of a visual learner, the video below walks you through the sign up step by step! You'll also start to notice some new things on the blog that I'll be implementing over the next week or so, but no worries, all the links I usually post below the outfit photos will remain the same. The new features will simply be more visually engaging, allowing you to see more of what I'm posting on all my social media! I also don't want you to think that this means I won't answer questions y'all may have about the things I post about. I will still be doing my very best to answer each and every comment that is left here, Facebook, and Instagram. LIKEtoKNOW.it will just be a little additional help for you and I to get all the information we need as soon as possible! One of the new things I've already implemented is something on my sidebar titled "Shop My Feed". 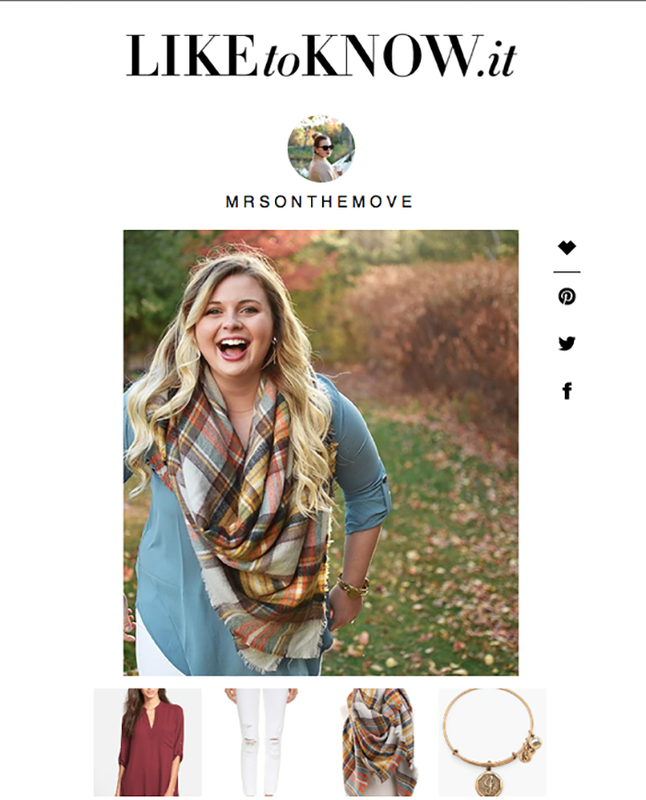 This is directly connected to my Instagram, and will allow you to click & shop directly from the blog! So if you don't have Instagram, or use it frequently, you'll still have access to all the information! I would love to hear any feedback and answer any questions you may have on this program, so feel free to leave a comment or send me an email! Happy Monday, lovelies!